All positions welding of 50 kgf/mm2 high tensile strength steels for ships, steel frames, bridges and pressure vessels. PA-7018 is an iron powder low hydrogen type electrode containing a large amount of iron powder in coating flux to give higher deposition rates. Deposited metal gives excellent mechanical properties, crack resistance and X-ray quality. It has good weldabilities such as smooth and stable arc, easy slag removal, low spatters, and nice bead appearance. PA-7018 stick electrodes require a “drag” to 1/16” max. arc length to obtain the desired mechanical properties and weld quality. An arc length of 1/8” or longer may result in porosity and serious deterioration of impact properties. Take the backstep method or strike the arc on a small steel plate prepared for this particular purpose to prevent blowholes at the arc starting. Polarity….Use DC+ whenever possible, with 5/32” and smaller sizes. Use AC with the larger sizes for the best operating characteristics (min. O.C.V. 70 Volts), but DC+ can also be used. Downhand… On the first pass, or whenever it is desirable to reduce admixture with abase metal of poor weldability, use low currents. On succeeding passes, use currents that provides best operating characteristics. Drag tip electrode lightly or hold as short an arc as possible, 1/16” max. when optimum impacts and x-ray quality are required. 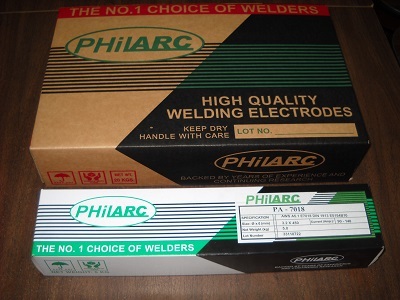 Do not use a long arc at any time because this type of electrode relies principally on molten slag for shielding. Stringer beads or small weave passes are preferred to wide weave passes. Layers should be kept as thin as possible (3/16” max.) for best properties. When starting a new electrode, strike the arc ahead of the crater, move back into the crater, and then proceed in the normal direction. Use higher currents on AC than DC. Govern travel speed by the desired bead size. Vertical…Weld vertical-up with 5/32” and smaller sizes. Use a triangular weave for heavy single-pass welds. For multipass welds, first deposit a stringer bead using a slight weave. Deposit additional layers with a side-to-side weave, hesitating at the sides long enough to fuse out any small slag pockets and to minimize undercut. Do not use a whip technique or take the electrode out of the molten pool. Travel slow enough to maintain the shelf without causing metal to spill. Use currents in the low to middle portion of the range, depending on joint design and plate thickness. Overhead…Use 5/32” and smaller electrodes. Deposit stringer beads using a slight circular motion in the crater. Motions should be slow and deliberate. Move fast enough to avoid spilling weld metal, but do not be alarmed of some slags spills. Use currents in the lower portion of the range. The test was conducted in accordance with JIS Z 3113 by Glycerine Replacement Method.